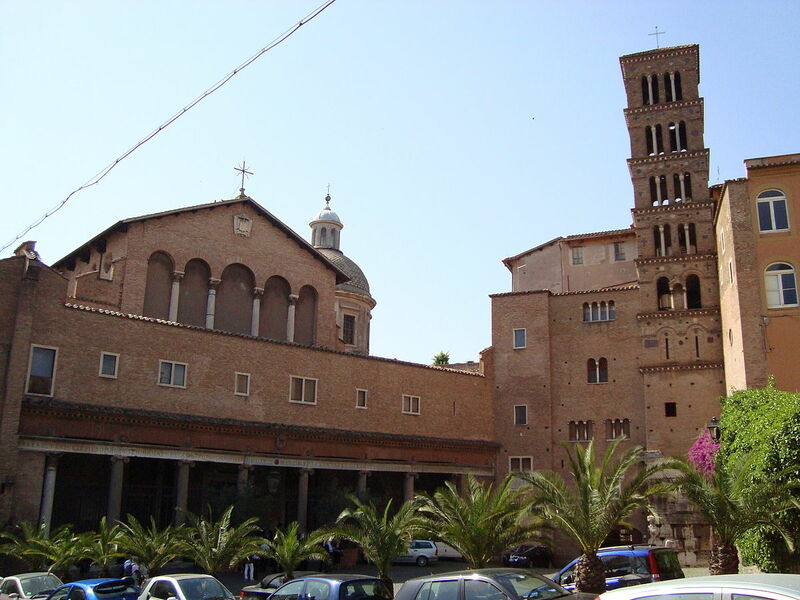 Located a short distance from the Colosseum, Santi Giovanni e Paulo is our stop for today. It is built on the site of some ancient Roman ruins - among them the home of John and Paul - the patrons of this church - who here witnessed to the Faith with their blood. In the foreground you can see Cardinal O'Brien walking toward the church. Saints John and Paul were soldiers who were chosen to serve as functionaries in the Imperial household in the middle of the 4th century. Although the Imperial family was often in heresy with regard to many of the theological disputes of this time, these two saints were able to continue in their offices while holding to the Truth Faith. However, when Julian the Apostate ascended to the throne in 360, they were forced with the decision either to embrace the renewed pagan religions that he was bringing back OR to face death. They chose death. Refusing to cooperate with the Emperor's demands, they were executed in their home on this site and buried nearby. Although such an execution within the city walls was illegal in Rome, it is thought that the Emperor sought to be as discreet as possible about the matter because of the unpopularity of his command. As often happened in these times, following their execution, their friends and fellow Christians began to come to the tomb to venerate these martyrs. The emperor did not like this and so he had three people (Crispin, Crispanus and Benedicta) decapitated on their tomb to discourage others from venerating their graves. In 398 a wealthy senator, who happened to also be a friend of St. Jerome, had a basilica built over the home of these martyrs - and it was dedicated to their memory: The Basilica of Saints John and Paul. The location of their martyrdom is marked in the church with a special plaque in the floor - located directly above the place where, in their own home (several layers underneath the current street level) they were killed for their faith in Christ. The inscription on the stone says, in Latin: "Locus Martyrii Ioannis et Pauli In Aedibus Propriis." Or, in English: "Place of the martyrdom of Saints John and Paul in their own house." Their relics are contained in a large urn under the main altar (sorry, a chair was in the way). Likely completed before 410, the church was further decorated in the middle of the fifth century. The basilica did not experience any major events of note until the late eleventh century. At that time, during one of the conflicts between the pope and others in Rome the pontiff had been driven from the city. Attempting to retake the city, he enlisted the aid of a Norman army. However, when the attack occurred in 1084 not only did the pillaging army cause much destruction, but also the fires which sprang up amidst the chaos. Along with many other churches in the area, this basilica also suffered heavy damage, with repairs taking place in the early twelfth century. Later that century the porch and campanile [bell tower] were both built. In fact, the foundation of the bell tower are large, marble blocks that are remains of the podium on which soon the temple dedicated to the deified emperor Claudius (who reigned from AD 37-54). The church would be renovated several times between the 15th and 18th centuries, with the current interior dating largely from a renovation from 1715-18. In the late 1850's a sacristy was added as well as a large chapel dedicated to St. Paul of the Cross, founder of the Passionist Order - who serve the basilica and uses its surrounding monetary as the world headquarters for the Order. The left scene if of the two saints giving their possessions to the poor. On the right is the conversion of the official who supervised their execution, after the healing of his son through the martyrs' intercession. In the center, a scene depicting their martyrdom. In the last 1800's archeological excavations and studies of the Roman ruins beneath the church began. There they discovered two houses, known as Casa Roman, dating from the 2nd century (the 100's) as well as an oratory dating from the 4th century (the 300's). Today, this excavation is open to the public - although not until 10am, so I didn't get to visit today. I'll have to come back another day. From 1948-50 a restoration/renovation was conducted by Cardinal Spellman of New York, who was given this church as his "titular church." Among the additions were beautiful chandeliers which legend says (as Cardinal O'Brien told me on the way to the church this morning) came from the Walforf-Astoria hotel in New York City. Unfortunately, it is not true. SIDE NOTE: did you ever wonder why Cardinals have "titular churches" in Rome? Because Cardinals are, technically, members of the Clergy of Rome - and so each, no matter where they work or live or serve, is "assigned" a church in Rome that is "theirs." However, they have no authority over those churches and, in fact, stay out of the church's affairs. At Rome, on the Salarian Way, the birthday of the holy martyr, Saturnius, an aged man, and the deacon Sisinius, in the time of Emperor Maximian. After a long imprisonment, by order of the prefect of the city, they were placed on the rack, stretched with ropes, scourged with rods and whips, garnished with metal, then exposed to the flames. Taken down from the rack, they were then beheaded. At Rome, in the cemetery of Trasions on the New Via Salaria, Saint Saturnius of Carthage, martyr, who, Pope Saint Damasus relates, that under the Emperor Decius, in his homeland he [St. Saturnius] was placed on the rack for Christ, and sent into exile in Rome, where, having overcome other severe tortures, converted the tyrant Gratianus to the faith and, being beheaded, obtained the crown of martyrdom. His remains are here in this side chapel. Leaving the church this morning, there was a beautiful view of the hill that leads to the church and the ancient foundations. Another side note: During Eucharistic Prayer I (the Roman Canon) there is this LONG list of saints. In the first of the two groupings we hear: "In communion with those whose memory we venerate, especially the glorious ever-virgin Mary, Mother of our God and Lord, Jesus Christ, and blessed Joseph, her Spouse, your blessed Apostles and Martyrs Peter and Paul, Andrew... (then a list of the apostles)... Linus, Cletus, Clement, Sixtus, Cornelius, Cyprian, Lawrence, Chrysogonos, JOHN and PAUL, Cosmas and Damian and all your Saints; we ask that through their merits and prayers, in all things we may be defended by your protecting help. So today, having "visited" the tomb of these two ancient martyrs for the faith, we perhaps DO ask for their intercession - that their merits and their prayers will help obtain for us the graces and protecting help we need from God to overcome our faults and failures, and more faithfully serve our loving God and Savior.